Twenty-five years ago a group of geologists, geophysicists and geochemists ventured 330 kilometers (250 miles) northeast of the Galápagos Islands in search of what at the time was only a theory: hydrothermal vents. Following the acceptance of plate tectonics, scientists hypothesized that cold, dense oceanic water seeped through cracks along underwater volcanic spreading ridges, where hot rocks heated the water, allowing it to rise to the seafloor as underwater hot springs. Detailed seafloor maps had given scientists an idea of where to search for evidence of such springs, but none expected to find a unique community of animals calling this underwater scene home. 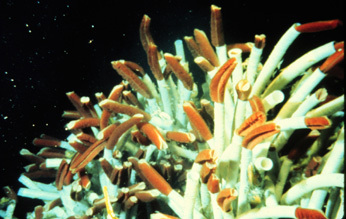 Tubeworms at the Galápagos Rift. Photo by John Edmond, MIT/WHOI. Not a single biologist was on board the expedition when the Woods Hole Oceanographic Institution's submersible the Alvin brought up giant red tubeworms, clams the size of dinner plates and ghostly white crabs. The discovery of the hydrothermal vents and their suite of specialized creatures fundamentally altered our understanding of the oceans. No longer were the abysmal depths remote places where animals were few and far between, surviving primarily on what fell from the surface waters above. Here was a community of animals surviving directly off of the chemicals and mineral-rich waters emerging from Earth's oceanic crust. Finding a life cycle based on chemosynthesis and not photsynthesis provided the impetus to examine the potential for such life forms elsewhere on Earth and in our solar system. Bugs or bacteria living in acidic environments, on ice or within the extreme temperatures of hydrothermal vents are today known as extremophiles. 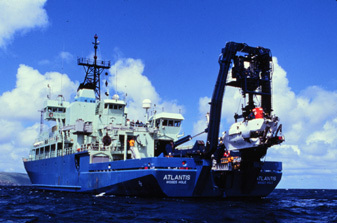 The Research Vessel Atlantis with the Deep Submergence Vehicle Alvin on the A-frame. Photo by Christopher Knight, WHOI. Over the next 11 days, scientists and crew on board the research vessel Atlantis will again explore the site of the first hydrothermal vent discovery near the Galápagos Islands. They will look at how the biological community has changed over time and explore the Galápagos Rift for other undiscovered hydrothermal vents. Join them on their current expedition by visiting the Dive and Discover Web page below.